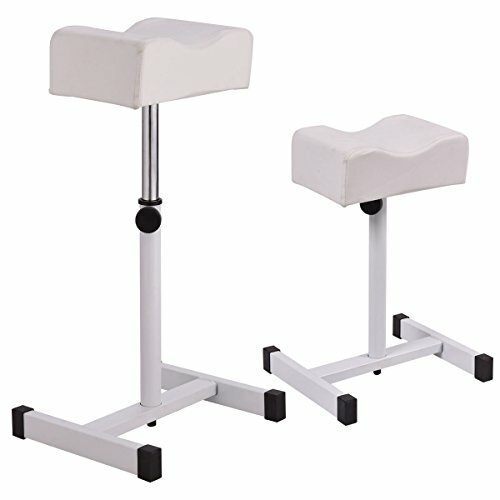 Our salon footrest are made of industrial great PVC leather and thick foam cushioning for maximum comfort. The footrest is manually adjustable to make your work easy and convenient. What's more, with the feature of height adjustable, the footrest will meet people different height requirement. Made of steel, this footrest will be durable and sturdy. It's not only suit for the salon or spa for commercial use, but also good for domestic use. Do not hesitate to buy one! Great PVC leather and thick cushion of the footrest. Steel frame, durable and sturdy. Height adjustable to meet people different height requirement. Suit for salon, spa commercial use, but also good for domestic use. Material: steel, PVC, and cotton. Overall dimension in the lower position: 12.5"x11"x17.5"(LXWXH). Size of cushion: 10"x7"x3.5(L X W X Thickness). Package include: 1 x footrest.